The Patapsco River flows for 39 miles through central Maryland and ultimately into the Chesapeake Bay. The last 10 miles of the Patapsco River form an estuary that is home to Baltimore’s Inner Harbor. Historically, the Inner Harbor was an important seaport and is still an essential component to Baltimore’s economy by being home to one of the city’s largest tourist attractions. Baltimore’s aging infrastructure is having a hard time keeping up with the city’s needs. Each day, Baltimore city delivers 265 million gallons of water to its 1.8 million residents and treats 139 million gallons – that’s the equivalent of 147 gallons of clean water delivered and 139 gallons of water treated for every single resident. Further, millions of gallons of polluted, untreated water enter the Patapsco River each year due to leaks in the nearly 100-year-old infrastructure. A reduction in residential water use would decrease the amount of water entering the Patapsco River, thereby improving the quality of the river. In addition to Baltimore’s aging infrastructure, the city faces a crisis of job access and high poverty rates. In 2015, Maryland and the U.S. each had an unemployment rate of 5%, and Baltimore‘s unemployment rate was 7%. The disparity is even greater among African American men and formerly incarcerated individuals, whose unemployment rates were 22% and 60-70%, respectively. To put it into perspective, the unemployment rate during the Great Depression was 25%. With the aging infrastructure, environmental quality issues, and economic disparities, Baltimore was in need of some help. Civic Works, Baltimore based non-profit, created the Baltimore Center for Green Careers (BCGC) in response to these issues. In 2012, Civic Works was awarded an Urban Waters small grant to meet the challenge of reducing residential water use by expanding the work of BCGC. Since 2003, BCGC has accomplished its mission to “expand access to family-sustaining green careers for Baltimore residents traditionally locked out of high paying jobs” by training over 650 Baltimore residents who were previously unemployed or underemployed to work in mid-level STEM jobs (Science-Technology-Engineering-Math). The training tracks include classroom instruction, hands-on training, and on-the-job training designed to help participants learn necessary professional and personal skills to be successful in the workplace, including finding work/life balance, stress management, resume writing, and interview skills. In 2016, 103 participants were enrolled in BCGC’s three training programs, with an overall graduation rate of 83%. The average starting wage for program graduates was $15.21 per hour and 90% of graduates were successfully placed with jobs upon graduation. With its Urban Waters small grant, Civic Works expanded the goals of its energy retrofit training program to also reduce residential water consumption, develop and implement a stormwater management training program, and improve the overall health of the Patapsco River. Civic Works trained five contractors to install indoor water retrofits and motivated homeowners to complete 439 indoor water retrofits, which resulted in the conservation of 1,855,700 gallons of water each year. Civic Works implemented a six-hour stormwater management training as part of its Brownfields and Environmental Assessment training. Seventy-seven BCGC participants attended the training and learned about Baltimore’s watershed, stormwater management and the impacts of stormwater on urban aquatic ecosystems. Further, they were trained to calculate runoff volumes, install rain barrels and cisterns, and to put in place filtering systems to reduce pollutants. Ninety-one percent of those who participated in the stormwater training program have graduated and eighty-four percent of graduates were placed into jobs that pay well enough to sustain a family. Workforce development programs, when successful, change lives. Before enrolling in the Energy Retrofit training program, Gus had a difficult time finding a job to support himself and his three young daughters, partly because of a record that includes multiple criminal charges and a conviction. Gus found himself dealing with a myriad of challenges not uncommon to those in similar circumstances– he felt trapped in poverty, bounced from relative to relative to sustain housing, and watched friends die and family members be sent to jail. Gus learned about BCGC from a friend who had participated in one of their programs and thought it would be a great opportunity to be able to support his family while creating a career path for himself. Upon graduating from the Energy Efficiency program in September 2014, he obtained a position with a local company as an Energy Retrofit Installer earning $13 per hour. A year later, the company recommended Gus apply for BCGC’s Building Performance Institute (BPI) Building Analyst and Envelope Professional training. After completing the BPI program, he was promoted to Crew Leader and currently earns an hourly wage of $18.75. BCGC’s training program includes a Personal and Professional Development element that provides participants like Gus the tools and resources to overcome obstacles in their professional and personal lives, such as financial management, decision making, and setting goals. To Gus, graduating from BCGC’s program “means having a skill set and being able to have a career, instead of running around trying to get another job doing manual labor.” Gus’ challenges are not unique–many BCGC participants face similar life obstacles. Graduates of BCGC programs continue to be successful and are presented with opportunities they had only dreamt of before. BCGC programs make job and financial stability possible. Due to the success of the stormwater management training funded by EPA Urban Waters grant, Civic Works and the Center for Watershed Protection will be launching a three-month Stormwater Construction and Maintenance certification program in 2017. There will be classroom instruction, hands-on training, and on-the-job training that includes vegetation identification and maintenance for green infrastructure, erosion and sediment control practices, and installation and maintenance of stormwater practices. 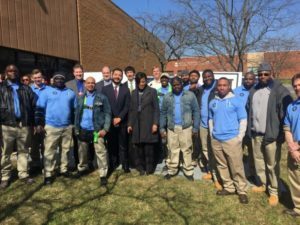 This program will allow participants, in similar situations as Gus, to obtain jobs at a living wage and provide the much needed knowledge and skills necessary to improve Baltimore’s stormwater infrastructure. Civic Works strengthens Baltimore’s communities through educa on, skills development, and community service. 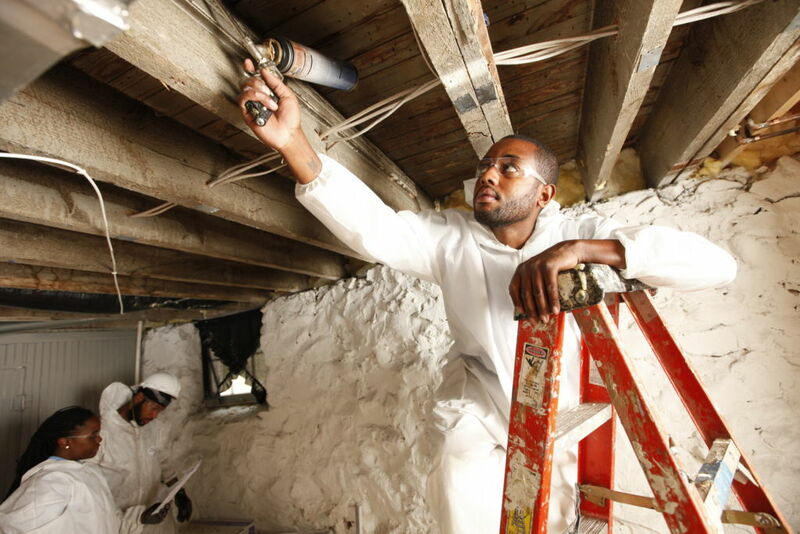 The mission of Civic Works’ Baltimore Center for Green Careers is to make Baltimore’s economy more equitable and sustainable by training residents for jobs in the emerging green economy. Since 2003, the combination of meaningful employment, a living wage, and marketable trade skills has proven powerfully successful.